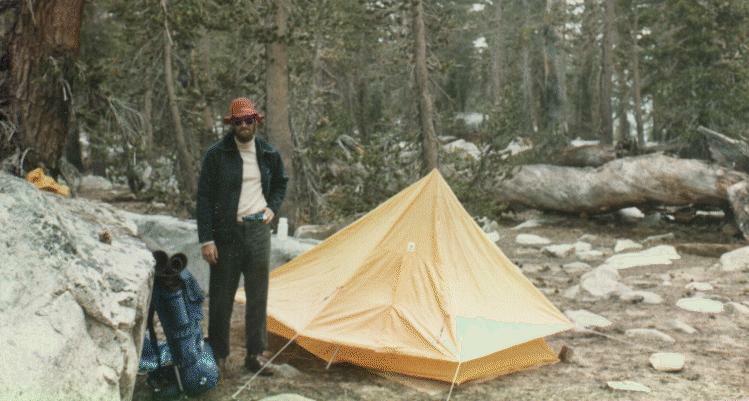 When I was a child in Southern California my father took by brother and me camping on a regular basis. There is so much to explore there -- the San Gabriel and San Bernadino Mountains, the Mojave, Anza Borrego, and Joshua Tree deserts, abandoned gold mines, derelict ruins, hidden lakes. And further away, the Southern Sierra. When I think back on it, we did some outrageously risky things in those days, with my father and out of his sight. I am thinking of times when we hit a big rock and disabled the car miles and miles from the nearest highway (twice no less). Once the car froze and we waited all day for it to thaw (by dusk it was still frozen, and we had to start to walk). Or the time we went backpacking with no tents or even groundcloths, and it started pouring in the middle of the night, turned to snow, and six of us spent the rest of the night in an outhouse (standing room only). 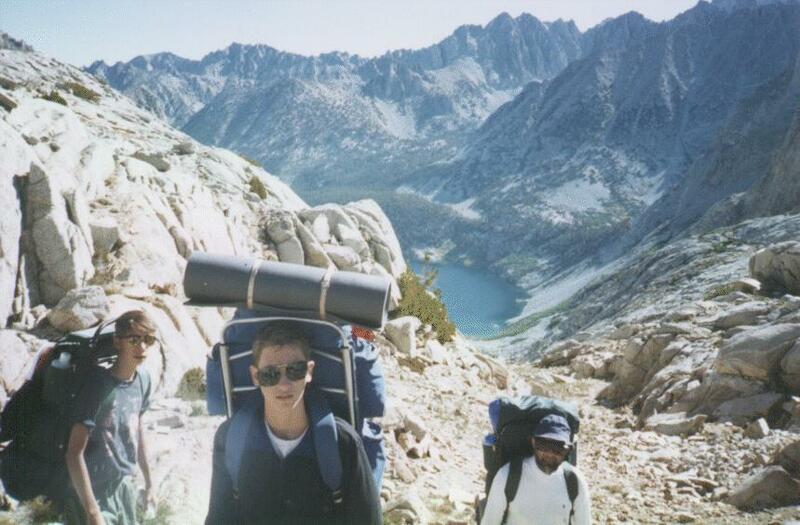 Miraculously, as an adult my love of backpacking has remained with me. Alas, I am now living in New Jersey. I have tried the Catskills, the Pine Barrens, the Adirondacs. They have never developed the hold on me that the Sierras still posses. Even before I moved East, when I was living in Los Angeles, I found it more convenient to fly to Fresno and take a bus to Sequoia than to drive. The trip is only a bit longer from New Jersey. I still find it amazing that I can leave home in the morning, get to Fresno in the early afternoon, get up to Sequoia before five, and be in the backcountry that very evening. Over the years, I have taken my son and daughter, separately and together with their friends. I have gone with my father a couple times. But mostly I have gone by myself. I know this increases the risks, and it also increases the pleasures, but mostly it is forced upon my by circumstances. Maybe the WWW will help me to find companions to share these adventures with. If you are interested in joining me, let me know. The following pictures are a random selection from the many trips I have been on. It is amazing how feebly pictures convey the feeling of the mountains, and how much less they would mean to someone who cannot link them to the memory of actually being there. If you have ever explored the backcountry of Sequoia/Kings Canyon, maybe some of these pictures will stir your memories. 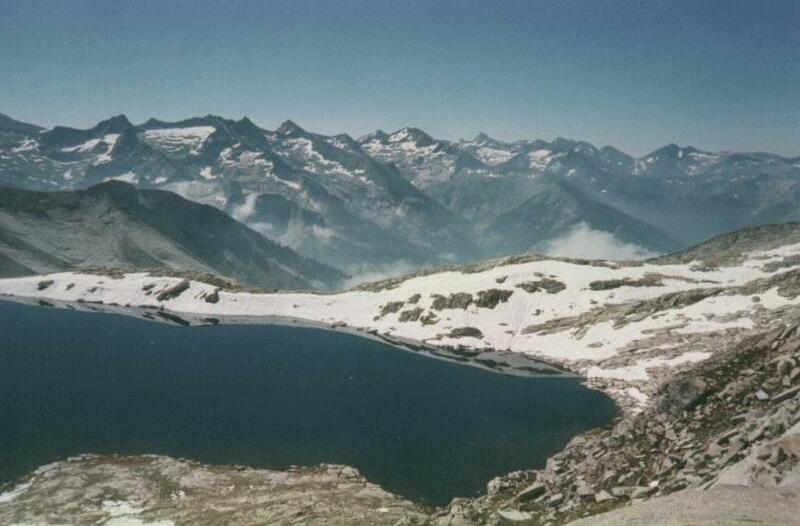 The gulf between picture and memory is especially true of pictures taken from the highest peaks. 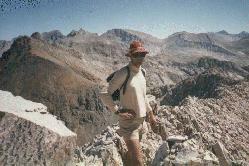 Here I am on the ridge just below Triple Divide Peak. It seems like sheer cliffs on both sides. I have not seen another hiker in days, and am feeling pretty nervous. The picture makes it look pretty easy, right ? On the other hand, sometimes the pictures can capture the feeling. Here I have just come through a pass that was pretty gentle on one side, and face a huge cliff on the other. This is Vennacher Needle (or something in the vicinity - I was never quite sure). I made it down, but it took me several hours to regain my composure after that. I have explored most of the territory in the Sequoia/Kings Canyon park system, on trail and off. 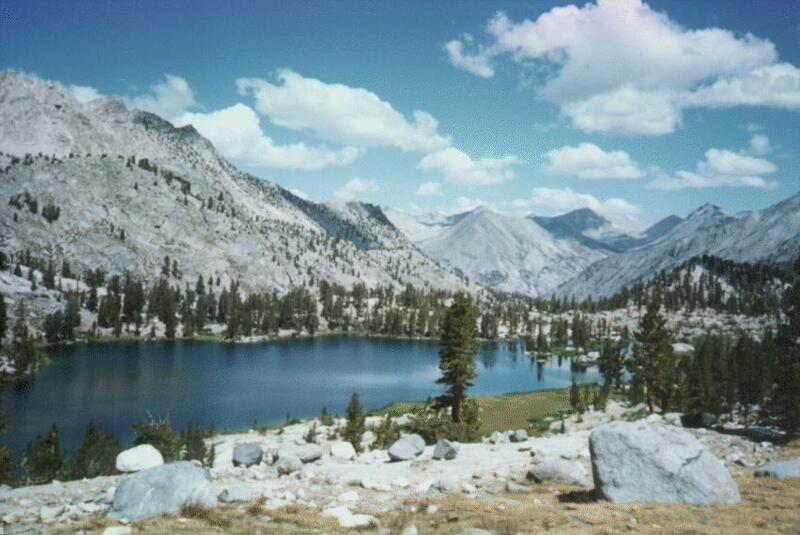 One of my favorite places has always been Table Meadows, above Pear Lake. It is one of the easiest places to get off the trails, into the real wilderness. 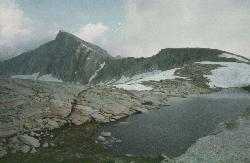 It is relatively flat, treeless, with good landmarks for easy navigation. And it is beautiful, with many lakes and vistas. 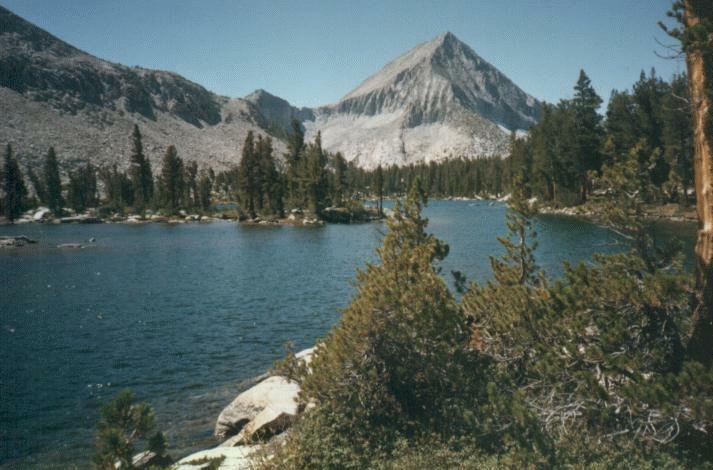 Because it is near the popular Pear Lake trailhead, it has gotten more and more common to see other travelers there over the years. This lake, at the headwaters of Big Bird Lake, is a favorite stopping place on my way out. 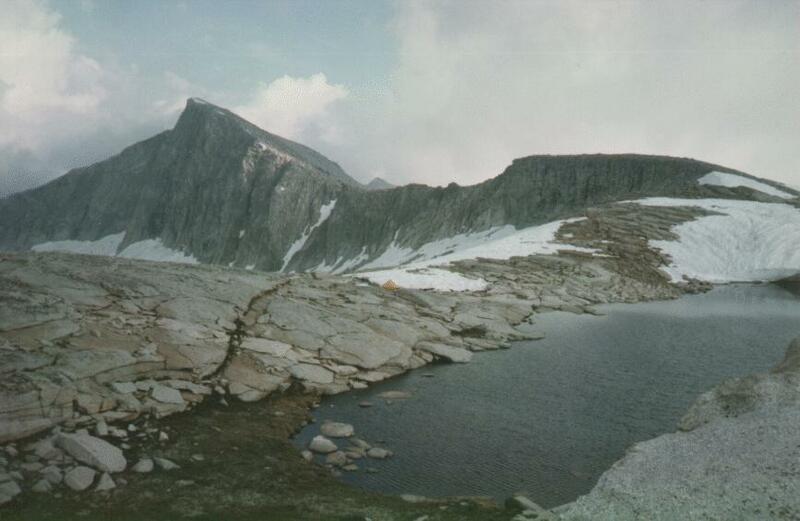 Where the previous picture show the lake and the gentle Table Meadows on a sunny day, this picture shows the same lake, which is perched just on the edge of tremendous cliffs at 11,000 feet, as a storm is coming in. It is hard to get a sense of scale in these photographs. Can you see the tent in the center of this picture ? 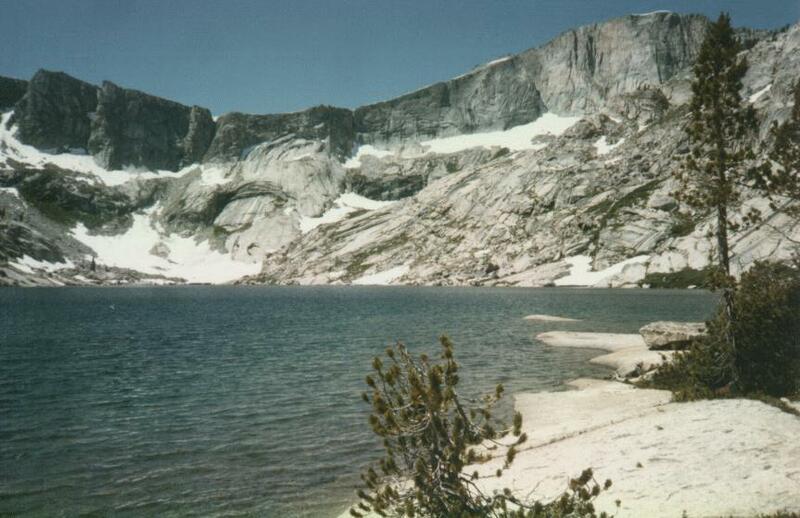 This shows more clearly the view of the cliffs surrounding Big Bird Lake, separating Table Meadows from the more rugged country to its East. The view is of Big Bird Lake, which is just a little ways off the Elizabath Pass trail and another very popular destination for off-trail hikers. One of the most memorable trips I took as a child, and perhaps the one that got me hooked on backcountry travel, was a trip with my father, brother, and several other kids from the neighborhood. 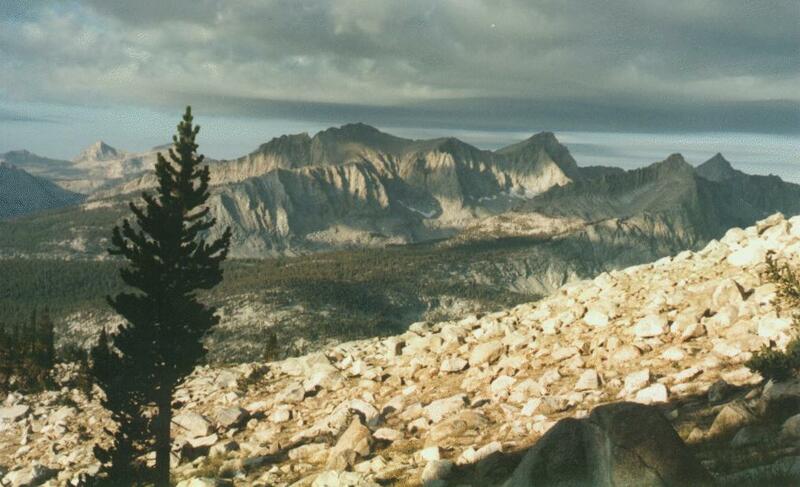 We started by climbing Mt Whitney, and continued across the Pacific crest trail to Giant Forest. Our ignominious fiasco in the outhouse was actually in preparation for this expedition. (We added a tarp, but still no tent to our gear.) 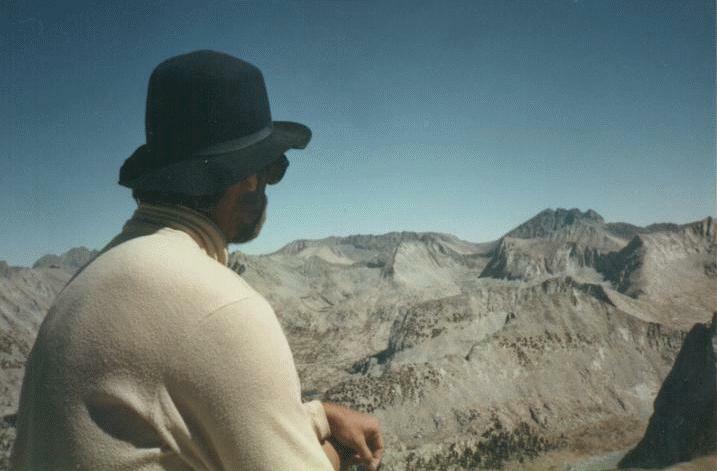 After crossing the Kern River, and consulting with a ranger, my father decided to take a short cut across the Great Western Divide, which involved some off trail hiking and getting through a class 2 pass (Pants Pass). I still remember the thrill of going where there was no trail or sign that anyone else had been here. The pass itself still scares me. I have never again had the courage to plan a trip that required me to climb it with my pack, although I have climbed u one side or the other with a day pack. The lake pictured here sits among weirdly-colored rock, which the photo labs have no idea how to print and which always coming out far from the right color in pictures. For me one of the scariest parts of hiking, apart from falling, is getting caught in a storm. I have plenty of pictures of rain and hail storms, which just look like fog, like everything is out of focus. This picture, taken on Sawtooth Pass in the Mineral King area in a year of very heavy snowfall, shows a storm approaching from the East. I had seen dozens of hikers on the way up, but they all took off as the storm approached, and I had the trail to myself for the next three days. On the other hand, the thunder and lightning continued for the whole trip, and I cursed myself over and over again for getting in such a situation. I do carry a tent, although some would consider that a sissy thing to do. It gives me great peace of mind at night when the weather looks threatening, it comes in handy when there are lots of bugs out, and I can pitch the fly without the tent in the middle of the afternoon to take a nap out of the sun above the tree line. This is a great little tent, now almost 20 years old. For a few years it was my ambition to climb the most prominent peaks in the area. On my very first trip, mentioned above, I had gotten a good look at Triple Divide Peak, and had passed by it on several sides, and I determined to climb it. The first two times I tried I got close, but chickened out. My nerves just gave out. Now I realize it was a combination of exhaustion and altitude sickness that was making my heart race, but I find it is impossible for me not to interpret these as signs of terror. Now I try to put the more strenuous climbing later in the trip. I eventually made it up Triple Divide Peak, as shown in an earlier photo. 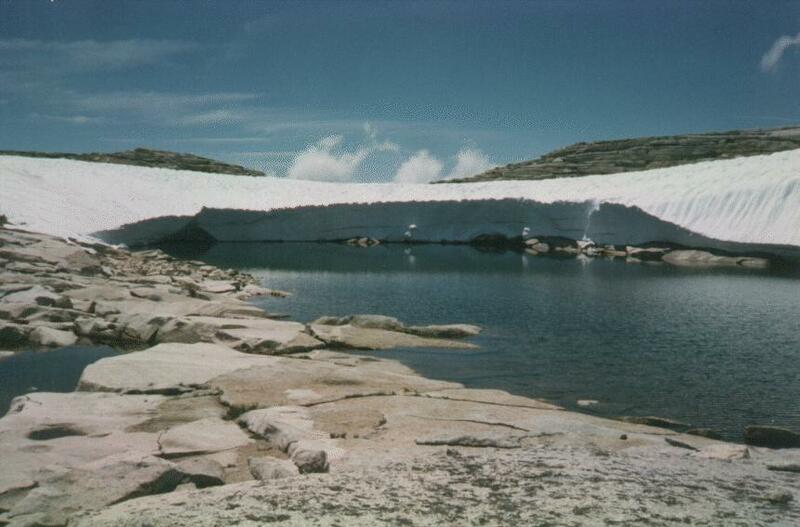 This picture shows Arrow Peak, with Bench Lake in the foreground. I climbed up the pass to the left of the peak, camped just beyond the pass, and climbed the slope on the left the next day. Tremendous views all around. More memorable was Arrow Canyon, which I followed out to Paradise Valley. This is one of the remotest spots I have visited. I encountered a couple near the headwaters of Arrow Creek, who told me they had been coming to this same valley every year for over 20 years, and I was the first person they had ever met there. They graciously told me how to get down the cliffs at the left -- I am not sure I could have done it otherwise. This is the south face of Mt Brewer. 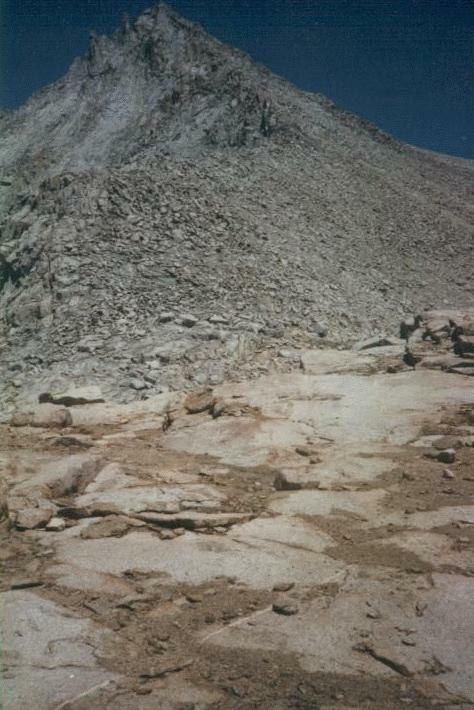 As a boy I had read William H. Brewer's account of climbing this peak, and had made up my mind to climb it. The first time I tried I was turned back by a forest fore in Cloud Canyon, although later the ranger laughed at me for not just walking through it. (It was burning the whole width of the valley. Why did they not mention it when I got my backcountry permit ?) The second time several years later I got to within 100 feet when a gigantic electrical storm chased me off the peak. This view of the route up the South face looks easy, but it is still 1500 feet to go. This picture was taken on top of Marion Peak. I used the timer on my camera to take most of these pictures. Pictures from the top look so unimpressive, but I just cannot help including one. 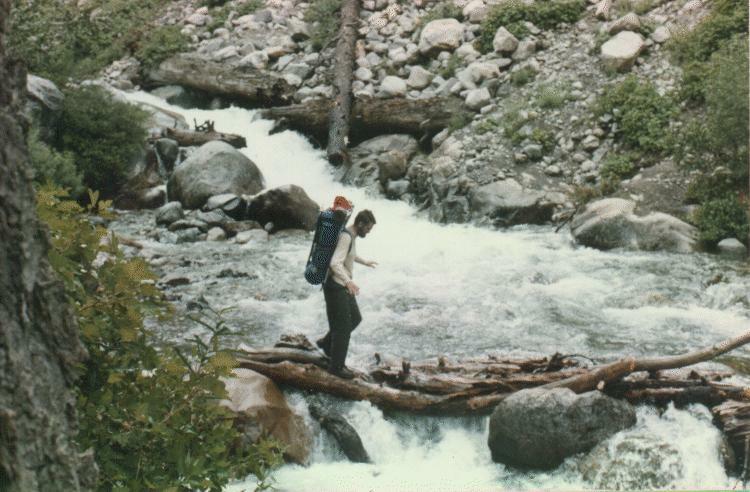 Although the danger of falling off a cliff or otherwise becoming incapable of travel are the greatest threat to solo hiking, I tend to spend more time worrying about stream crossings. This is probably a result of another experience with a flooding stream in the San Gabriels. Unless you have experienced it, it is truly hard to understand how hard it is to remain upright in rushing water as shallow as knee-height. I sat beside this particular stream (Cliff Creek) for half an hour contemplating whether to try the logs or try to wade across elsewhere. I actually made it across without getting wet! 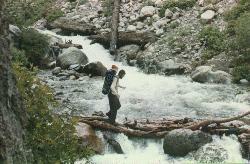 Most major stream crossings in Sequoia/Kings Canyon have bridges, and the crossings in the high country are not nearly so difficult. 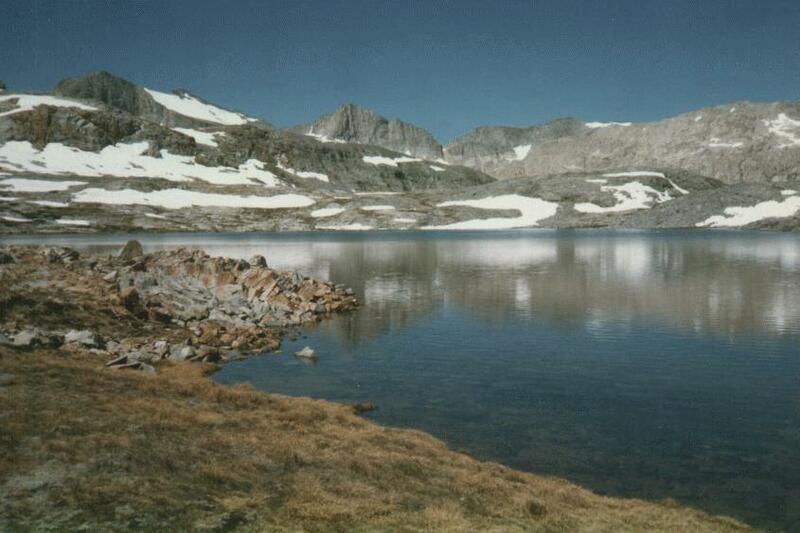 The amount of snow in the Sierra Backcountry varies greatly year to year. This particular year there was a lot of snow. As you can see, I came prepared with an ice axe. I didn't really have to use it much, but it gave me a great feeling of security crossing the many snow and ice fields covering the trail. Unfortunately I was with my father this particular year, and he did not bring anything he could use in this way, and besides his boots were smooth and slippery. I was greatly concerned for his safety. 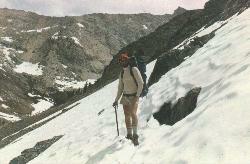 I can see now that I should have insisted he use the ice axe, as I was better able to get across without it. Luckily nothing bad happened. 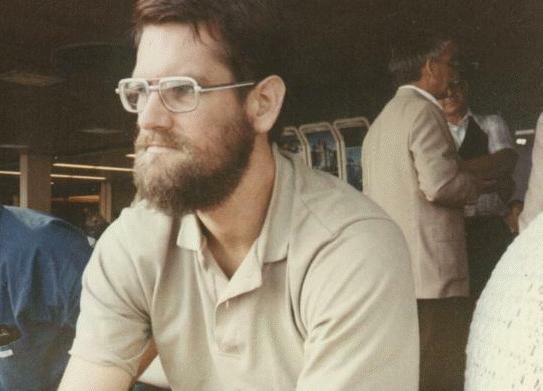 Here I am with my father. About 3 days out we met about the only other people we would see all week, and we got them to take this picture of us. I took my daughter Carrie (right) and her friend Eva. They were about twelve at the time, and enjoyed the experience, but have not agreed to go again. We spent about a week in the Tablelands, exploring the many lakes and meadows there. The girls never tired of turning over rocks, exploring around, hunting for marmots and pikas, and wading in the lakes. Another year, I took my son Ben (center). 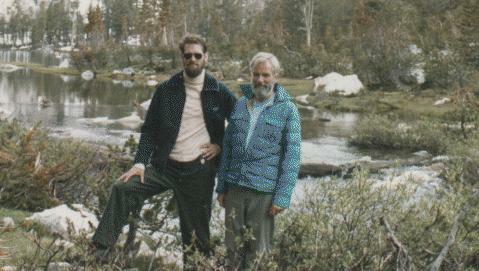 He brought his friend and his dad, who had never been backpacking before. Unlike the trip with the girls, this trip was planned to be very strenuous. Here we were headed up toward Mt Brewer from Reflection Lake. 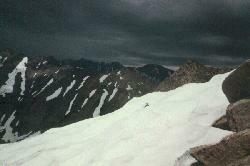 We were ultimately turned back by snow in a critical pass. 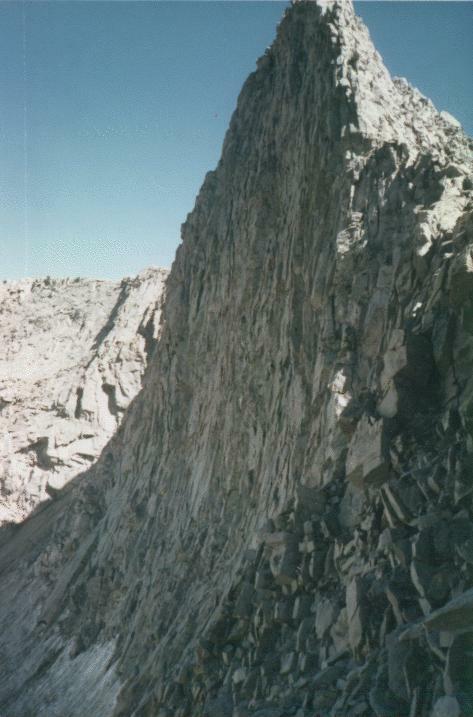 The Kaweah Peaks Ridge is visible on the Southern horizon of the Tablelands It is notable because of the strongly colored rock in the higher elevations. 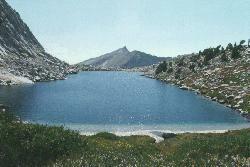 Most of the sierra is granite -- a light colored, solid rock that is a pleasure to hike on or scramble across because of its good texture. 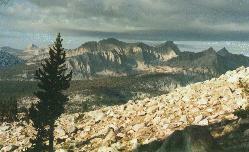 The granite was formed deep underground, beneath a layer of older sedimentary rock. As the mountains formed, this older rock eroded away almost everywhere. Everywhere except the Kaweah Peaks. The rock here is red and black, and is much more brittle and breaks into sharp pieces. 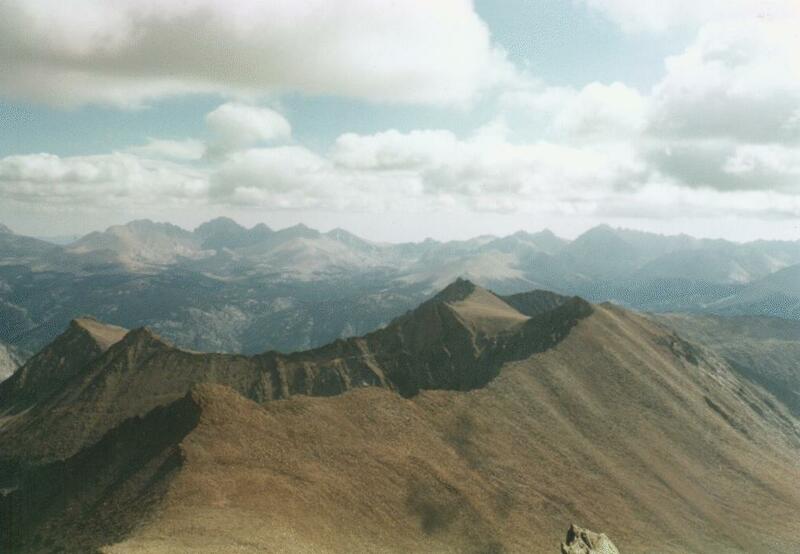 In this picture, taken from on top of Mt Kaweah, the surrounding ridges look pretty smooth. Up close they are a maddening expanse of boulders perched precariously to fall on you with the slightest provocation. Lonely Lake, its name noted only on the newest series of topo maps, is another one of my favorite places. I had seen it on the map, and had thought about going by it for years before actually doing it. I have never seen anyone else there, not even a footprint. But it is actually on a good cross-country route into the Deadman/Cloud canyon territory. There is significantly less elevation loss and gain than going by Big Bird Lake, the other alternative. Moose lake was the destination for my very first cross-country solo backpacking experience. 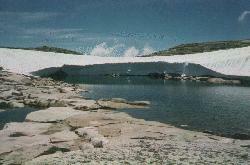 It is only a few miles from the end of the trail at Pear Lake, and the route is described in the popular trail guides. I think more people come cross-country than get there by the trail. When I was younger I could get to Moose Lake and beyond on the first hiking day. Now I stop short of it on my first day. It is one undeniable sign that I am no longer as strong as I once was. Rae Lakes is one of the most popular and heavily-traveled areas in Kings Canyon. I had avoided it for 20 years. But one time I had to alter my original plans because I could not make it over a pass I had planned to cross, and so I decided to do Rae Lakes. They were as spectacular as anything I have ever seen. I sat in the pass just looking down on them, taking in their breathtaking beauty. Alas, we passed at least two dozen campsites, each taken by one or two parties. At last we found an empty spot to put up our tent, just before a tremendous storm dumped a few inches of sleet on us.